Did you know that the creation and use of ceramics dates back more than 4,000 years ago, during the Ancient Egyptian era of 4,700 BCE? You may also find it interesting that the word ceramic comes from keramos, a Greek word for pottery. The word tile derived from tegula in Latin and tuile in French. Using tiles for floors first started in the Middle East and then became popular in Europe around the 11th century. This is when mosaic floors and panels first gained prevalence. Tile is created with the use of clay. After being shaped and dried, it is placed in a kiln in very high temperatures. This process (firing) hardens it, creating bisque. It is then glazed before being fired a second time. Some make unglazed tile, which keeps it at its original shades of color. For thousands of years, ceramic tile has been widely used in interior and exterior decor. You can find it in an array of textures, colors, glazes, shapes and sizes. Some use it to create mosaic designs, while others use plain decorations. Its popularity grew because of its aesthetic appeal and durability. It is also low maintenance. When ceramic tile flooring is properly installed, it can outlast just about every other flooring product that is used for the same purpose. Ceramic tile that is glazed is known to be resistant to odors, stains and dirt. It can be easily cleaned with a damp mop or common household cleaning supplies. If you were to purchase Grade III or Grade IV glazed ceramic tiles, you’ll find them to be very resistant to scratches, eliminating the worry of tears and cuts in your floors. 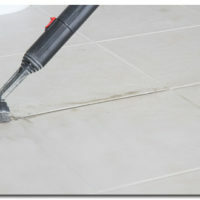 The Grout Medic can set you up with a local ceramic tile expert. We provide tile replacement, repair, and cleaning for ceramic, porcelain, and many other types of tile flooring. We are ready to help you restore the original beauty of your flooring!